If you’re a newer iTunes user, you’ve probably never heard of iTunes scripts. iTunes scripts are simply commands that let you take iTunes to the next level, making it more useful and user friendly. iTunes scripts are great for iTunes power users that love integrating iTunes with the rest of the internet. 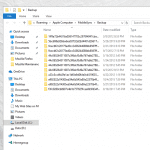 In this tutorial, we will be showing you how to install and use iTunes scripts. We will also spotlight some iTunes scripts we like and use daily. 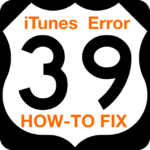 This tutorial requires the latest version of iTunes and a Mac running OS X Snow Leopard or higher. Installing an iTunes script is pretty simple once you get the hang of it. In a nutshell, it involves moving a bit of AppleScript to the core files of iTunes. 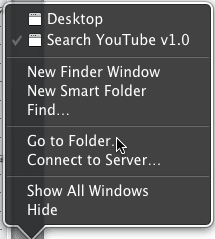 For this tutorial, we will be installing the Search YouTube script. If you would like to learn more about this script, continue to read this tutorial. 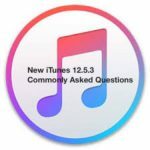 To start, download an iTunes script of your choice. We recommend Doug’s Scripts for an extensive collection of iTunes scripts. After you download a script, open the included DMG. DO NOT run the included AppleScript file. Instead, right click on the Finder icon in your Mac’s dock. When you do this a menu will appear. From this menu, click “Go To Folder…”. A popup window will then appear. Look towards the center of the popup window, where you will see a textbox. Type the following text into the text box: “Your Username/Library/iTunes/”. Now, press the “Go” button that is located towards the bottom right hand corner of the window. Now, create a new folder called “scripts”. This is where you will store all of the scripts you would like to use with iTunes. 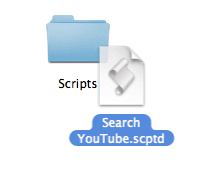 To install a script, simply drop the AppleScript file that you have downloaded into the Scripts folder. To use an installed script, open iTunes. Once iTunes has completely launched, look at the Apple Toolbar. You will now see a new option which is an AppleScript logo. If you click on this, you will be able to view and use your installed scripts. 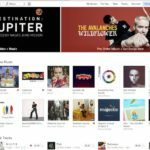 If you’re new to iTunes scripts, you may want a few recommendations on scripts to download. Below are a few useful iTunes scripts that we recommend for any iTunes user. This script is a great way to look up the videos to your favorite songs on YouTube. You can find the music video to the song you’re listening to in iTunes by simply pressing the script button. The Search YouTube script is available here for a free download. Guitar players will love this script! The Guitar Tab search script lets you quickly look up the guitar tabs for the song you are currently playing in iTunes. The Guitar Tab search iTunes script is available here for a free download from the developer. Super Remove Tracks is an absolute must have for any iTunes user. This script scans your iTunes library for dead tracks. Dead tracks are songs that are no longer on your Mac, but whose titles still show up in your iTunes library. Super Remove Tracks will automatically remove dead tracks for you. 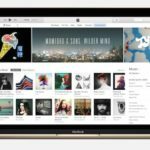 This will make your iTunes library cleaner, and save you time when searching for songs. Super Remove Tracks is available here from a free developer. Depending on where you buy your music, the song titles may or may not be capitalized. Inconsistency makes your iTunes library look unprofessional. 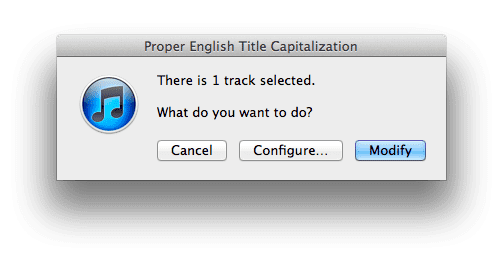 Luckily, the Proper English Title Capitalization script can fix this for you. This script will automatically search your iTunes library for song titles that aren’t capitalized and will capitalize them for you. 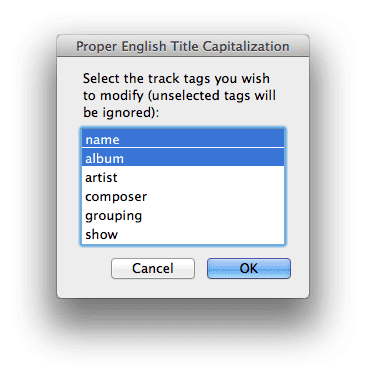 You can also configure Proper English Title Capitalization to search for composers, albums, etc. that aren’t capitalized. You can do this by clicking on the “Configure” button when you run the script. When you do this, a list of options will appear. From this list, you may choose what category you would like to scan for capitalization errors. Thanks for reading this tutorial. 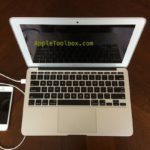 Check back to Apple Tool Box for more iOS and OS X related news, tutorials and reviews.